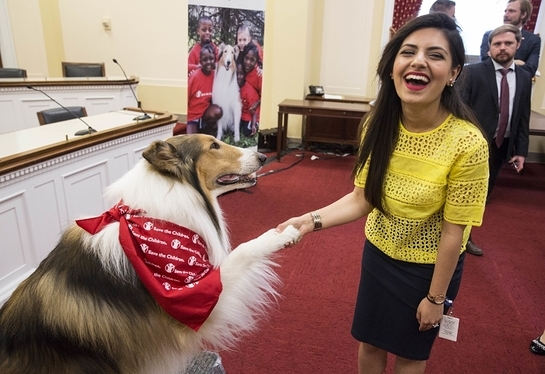 Lassie, the iconic collie whose latest role is animal ambassador for Save the Children, visited Congress Wednesday to inspire leaders to join her in protecting children from disaster. 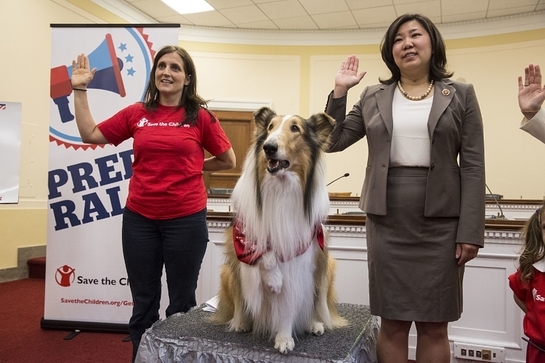 Nearly 10 years after Hurricane Katrina woke up the nation up to the extreme dangers disasters can pose to children right here in the United States, Lassie made her Hill visit en route to lead Save the Children Prep Rallies at local schools. The events are part of America’s PrepareAthon!, a grassroots campaign for action to get people better prepared for emergencies through group discussions, drills and exercises. “Lassie’s devotion to keeping kids safe is well known and she is an amazing addition to Save the Children’s emergency preparedness team. But let’s be frank, Lassie can’t be in all places at all times. We need you all to take leadership in protecting children from disaster,” Erin Bradshaw, director of Save the Children’s Get Ready Get Safe initiative, told attendees at Wednesday’s Capitol Hill briefing. Today a majority of U.S. families do not have a strong emergency plan in place and 21 states and the District of Columbia still lack basic requirements for emergency plans in schools and child care facilities, Save the Children experts told attendees. At the same time more than half of U.S families report having been personally affected by disaster. Prep Rallies and America’s PrepareAthon! After leading a pledge to protect children from disaster and posing for photos, Lassie left Capitol Hill for Mundo Verde Charter School in the NoMa neighborhood of Northwest Washington DC. There, Lassie led 90 first-, second- and third-graders in a Save the Children “Prep Rally,” which teaches kids emergency preparedness basics including how to recognize risks, make a plan, and gather disaster supplies. Through interactive demonstrations like the un-telephone game and disaster supplies relay race, children learned critical safety skills that they can take home and share with their families. Thursday, preparedness efforts will continue across the nation and in Washington, where Lassie is slotted to lead another “Prep Rally” at a child care center at the Department of Labor. In July, Save the Children will release its annual Disaster Report Card in advance of the Katrina 10-year anniversary. The report will detail what progress has been made and what gaps remain for protecting children from disaster since the National Commission on Children and Disasters formed after Katrina made a series of urgent recommendations. Families and caregivers can find emergency checklists and other Get Ready Get Safe resources at www.SavetheChildren.org/checklists.